Globe-trotting photojournalist Gage Lowell spent carefree childhood summers in Crescent Cove. Now that he desperately needs some R & R, he books a vacation at Beach House No. 9—ready to soak up some sun and surprise old friend and property manager Skye Alexander. Their long-distance letters got him through a dangerous time he can’t otherwise talk about. But when he arrives, the tightly wound beauty isn’t exactly happy to see him. Gage and Skye have each recently experienced trauma. While he sets out to help her heal, she does not know what he went through. The members of the other couple have let fear of abandonment keep them from taking the next step. Will they finally move beyond being "just friends"? It is part of a series and the couples from other books make appearances but the cast is not so big or convoluted that it is hard to follow if you haven't read the other books. Grade: B (would have been B+ if less explicit . I'd like to thank the publisher for making a review copy available via NetGalley. I have to admit Christian that this is one post I never expected to see you commenting on. I usually read the reviews even when I don't comment...I bought the Crystal Cove book today used on Amazon thanks to your post. IIRC, some of the kids who went to Crystal Cove each year grew up and got married. 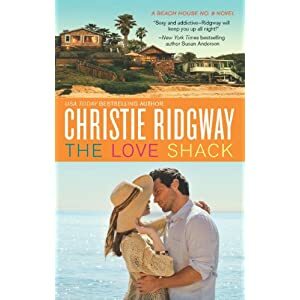 I'm curious now about LoveShack's author, Christie Ridgway; if I learn anything germane about her I'll post it.